Só Dança, a Brazilian label launched “The Bullet” in March 2018. It’s a contemporary half-shoe that is currently all the rage – it has the support of a ballet shoe, without feeling bulky. While it’s not the first of its kind on the market, the ‘Bullet’ promises not to twist, roll or expose the skin – a common problem with half shoes. This additional protection has been achieved by elongating the vamp and underside of the shoe, using a multi-way stretch canvas and installing an elasticated top line to keep the shoe streamlined. 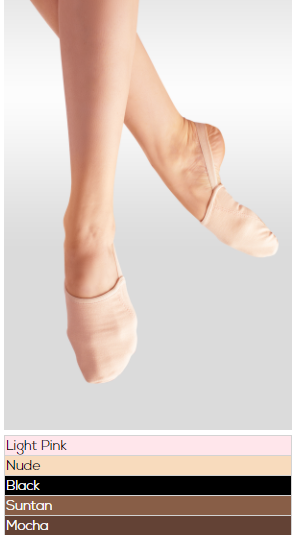 So Danca has also expanded its colour range to 5 colours – with the deeper two colours ‘Suntan’ and ‘Mocha’ being suitable for dancers of colour. We’ve trialed the ‘Suntan’ colour previously – it’s a dusky camel/latte – a reasonble (but not perfect) match for medium FleshTones. We will update you as soon as we get our hands on the new ‘mocha’ colour. So Danca promises to be ‘skin tone matching’ – but we all know companies without a vested interest in promoting dancers of colour can get this colour match oh so wrong. We haven’t passed judgement on this ‘mocha’ colour yet, but when we do, you’ll be the first to know! Disappointingly, it has been difficult to find a So Danca retailer selling the Mocha colour – many are playing it safe with beige and pink. We’ve put in a call to So Danca and will let you know if we hear back (or more than likely – track down the information ourselves).